Arunachal Pradesh Governor BD Mishra asked all the heads of various departments in West Siang district to “set target and bring results” when he met them at Aalo on Sunday. Arunachal Pradesh Governor Mishra was on a four-day tour of West Siang district on Sunday. Addressing a meeting, the Governor said the district and the State will progress, develop and go forward when all Government officers are transparent in their dealings, honest in the in their action and accountable in their approach. “You (Government officers) must make yourself available for audits, reviews and whenever required mid-course correction. Your conscience must satisfy you that you have done something for the people to the best of your ability,” Mishra said. Sharing the details of his meeting with the Associated Chambers of Commerce and Industry of India, the governor asked the officers to motivate, encourage and support the people, particularly the youth towards entrepreneurship through ‘Start ups’. Only job seeking attitude for the youth will not solve their problems. They must become job providers venturing into the realm of productivity, Governor BD Mishra said. Expressing his concern about the farmers, the governor advised the officers to go to their areas and resolve their challenges. “The aim of district agriculture and horticulture officers should be to introduce new crops, plants and fresh and dry fruit plantation to aid the farmers in doubling their income,” Mishra said. The Governor during the meeting also reviewed the implementation of flagship programmes of the government and discussed with the district officers on the issue of textbooks, mid-day meal in schools, completion of syllabus, recruitment for the armed forces and loans for Start Ups. Power and electrification of villages, handloom, handicrafts, road construction and women and child welfare were also discussed in the meeting. 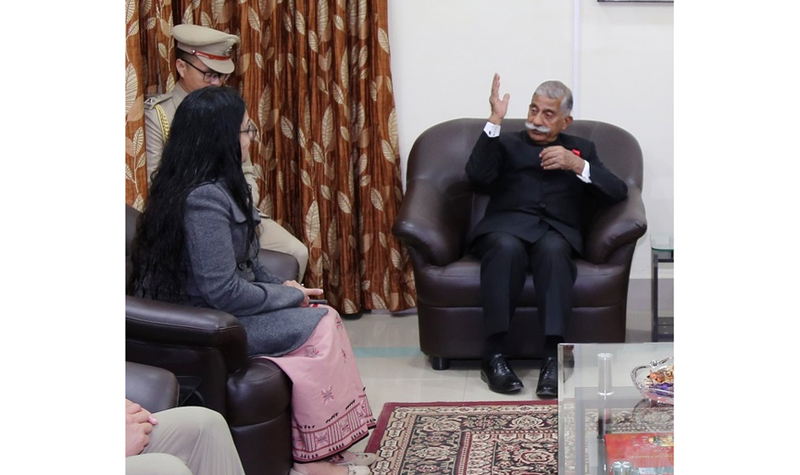 Earlier, deputy commissioner Swetika Sachan, superintendent of police Jummar Basar and the heads of department briefed the governor about the developmental achievements and progress in the district. 5 Mountain Brigade, Aalo commander Brigadier C Dayalan who was also present in the meeting briefed the governor about the operational preparedness of his troops and the civil population welfare measures being taken by the Indian army.